Basque are a unique duo hailing from Brooklyn N.Y. They are Brandt - Bass Guitar and Mary Asque - Vocals. This is their third album release to date. 'Somefire' is the first track on this well produced seven-song album. It slowly builds with weird atmospheric sounds that are produced by some interesting Bass layers; the sounds create an almost underwater feel, as if you are floating below an ocean, drifting with the motions of the waves. The waves of course being Mary Asque's beautiful enchanting Vocals. They flow along naturally and are perfect accompaniment for the already stirring scene that has been set by Brandt's mellow Bass scape. Her Vocals are more of a melody than they are actual words and they paint a moving picture. I like their mellow originality. A good opener. 'Falling Forward' is a seven odd minute song laden with feeling and expression, It has elements of Celtic style vocal harmonies mingled with what sounds like Acoustic Guitar picking and fretless bass slides. I can say that it is a great song and is good background music for relaxing. In certain places it reminds me Vocally of Deloris O'Riordan from the Cranberries for the Voice has a definite Irish feel to it, which I like. It shows that Mary Asque has a beautiful voice and that she is capable of producing good harmonies. 'Kamehamecha' also has an interesting Vocal which is set firmly in the Celtic mould, again more rhythmical and melodic than it is lyrical, but that seems to be a style that is being explored throughout this album. Well why not if you can do it so well? The music on the other hand is rather quiet and peaceful and it fits the Voice like a glove. Brandt seems to know what makes a perfect backing for Mary's voice and together they have worked out a style of their own. You can hear resemblance's to All About Eve in here and it makes for mellow listening. 'Grey and Green' is a five minute twelve piece that has some well played delayed fretless Bass on it as well as some effective tapping upon the strings to give a strange popping sound. I also can hear an Acoustic Guitar on it as well. The music is very laid back, almost silent, it moves at a slow pace but drives home what its purpose is. Its purpose is again backing for the Vocal that sways and dances, acting like an instrument itself. Again the Irish feel is apparent and Mary takes the song to a different level with her harmonic perfection. Simple effective Vocal arpeggios intertwine with the tune to make the song end in a rather colourful way. 'Inheritance' to me is the best track so far, the intro is very atmospheric with Brandt's Bass scape taking the lead and guiding the muse forward. Very mellow and spacey, I like his Bass style for it weave's an impressive scene, and is what makes Basque probably different from most other Bands of this type. And there are not many. The thing that makes this song my favourite is the way that the Vocal rises above the atmosphere created by Brandt and takes you inside its patterns. Mary has again produced some enchanting Celtic harmonies here, and in my eyes she stands out in this field because she has simply a stunning voice that is both inspiring and magical, and she knows how to use it to produce some fine sounding harmonic tones. I find that Basque is a very creative duo that seems to work really well together and they produce an overall sound that is quite atmospheric. 'In The Hollow Of Your Hand' is similar to 'Grey and Green' in its sound once it gets going. It is basically an Acoustic song that builds from the start. It offers some good Vocal technique and it moves through its phases quite nicely. It again has the All About Eve feel to it and it shows just how good a singer Mary Asque is. 'Orange Coloured Sky' is a Vocal only track that lasts just over a minute. It has a weird sort of beat to it; I cannot put my finger on what it sounds like. I have heard other people doing stuff like this, the main one being Suzanne Vega. A Nice end to a very good CD. Well there you have it. Let us say that Basque produces very mellow ambient Bass scapes merged with beautiful Celtic induced vocals. I can say no more than that, apart from I like it and am intrigued to hear the other two. Good listening for one of those quiet moments. 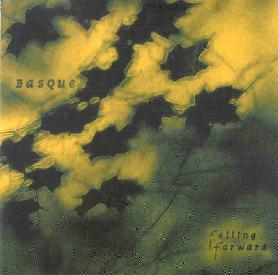 For more information you can visit the Basque web site at: http://basquemusic.com. Contact via snail mail c/o Basque; PO Box 632; Prince St Stn; New York, NY 10012.